Apple blew by once dominant cellphone makers Nokia and Samsung to become the top smartphone vendor, with over 18 percent market share, according to figures released by Strategy Analytics. In just four years since the release of the iPhone, Apple managed to become the world's largest smartphone maker, despite sharp competition from rival Samsung. The figures show Nokia has less than half of the smartphone market share it had last year, slipping in the ranking to the third spot with 15 percent share. Samsung has had a meteoric rise of 520 percent annually, currently taking the second spot with 17.5 percent market share. 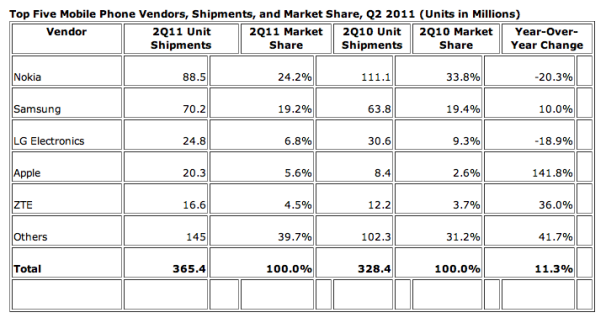 Apple is leading the pack with 18.5 percent of the smartphone market. Samsung's rise as the second largest smartphone vendor is due to the company's Galaxy line of smartphones, "especially the high-tier S II Android model," says Neil Mawston, Director at Strategy Analytics. Nokia's fall in the rankings is blamed on the industry awaiting Nokia's pending transition to Microsoft's Windows Phone 7 OS early next year, explains Tom Kang, also a director at the research firm. 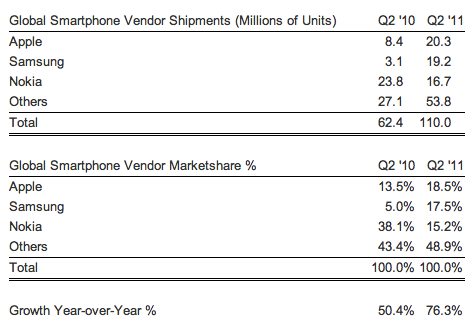 Apple, whose latest smartphone was launched more than a year ago (iPhone 5 expected in September), grew in market share compared to Q2 2010, when the company owned 13.5 percent of the smartphone market, to 18.4 percent in Q2 2010. "Apple's growth remained strong as it expanded distribution worldwide, particularly in China and Asia," detailed Alex Spektor, senior analyst at Strategy Analytics. Apple's success in the smartphone market is also placing the company as the number four mobile phone vendor worldwide (with 5.6 percent of the market), according to the latest figures from IDC. In terms of overall phone sales, Nokia is still strong at number one with more than 24 percent of the market, followed by Samsung with 19 percent, and LG third at 6.8 percent.